Nico Terol got his first point on Moto2 class after finished 14th on Le Mans circuit last weekend. 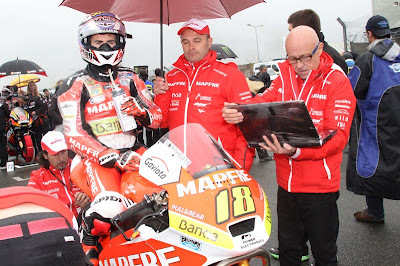 The 2011 125cc World Champion told that the bike was better on dry condition. On last Le Mans free practice, Terol marked as 6th fastest. Terol said, "The day was too complicated to go on a bike. The bike was slides a lot. We were very confident on dry condition, got sixth in FP3. But on a water today, we're lacked some pace." Speaking about the next race on Catalunya, Terol told that he like Catalunya a lot. Last year on 125cc class, Terol took his victory on Catalunya circuit. "The next race is at the Circuit de Catalunya that I love." said Terol.